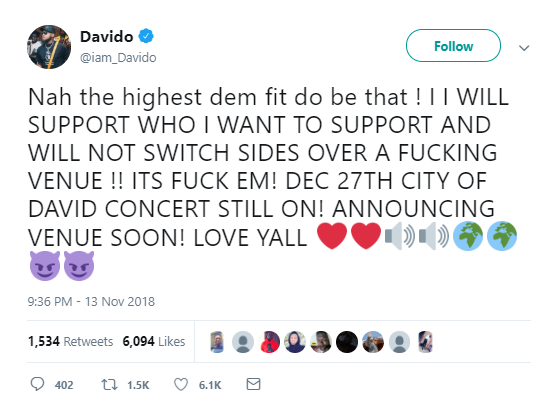 Davido has expressed his grievance at the refusal of higher forces to allow him to perform his concert at the International Eko Atlantic in Lagos. The artiste who is openly in support of the Peoples Democratic Party (PDP) used social medium, Twitter to state that despite this denial, a new venue will be announced. It should be recalled that his concert held last year, 30 Billion concert was rated Nigeria’s highest-grossing concert. Politics aside, this would have a source of generation for the Eko Atlantic.